The 2018 Yamaha FX Cruiser HO is the heir to the industry’s original cruiser. Kudos to the first personal watercraft designer who envisioned the “cruiser” model. An otherwise standard watercraft enhanced by the addition of a plush, supportive seat and typically the one-two punch of cruise control and no-wake mode, cruisers don’t reinvent the wheel but they certainly make it more comfortable and user-friendly. Yamaha’s FX Cruiser High Output established a benchmark in 2006. In its latest iteration, the Yamaha FX Cruiser HO, it remains one of the best of the breed. While cruise-oriented amenities make sense in nearly every horsepower range, those that truly want to use a cruiser to cruise will realize that a sweet spot exists in non-supercharged models, primarily because their engines are notably more fuel efficient. The Yamaha FX Cruiser HO doesn’t forego power; its 1,812cc engine remains the largest displacement currently in production. That 1.8-liter volume is more than enough to push the craft to just shy of the magic 65 mph mark (expect more like 63 mph in real-world conditions), accelerate aggressively at the touch of the throttle, or pull any water toys you care to attach to the end of a towline. But without the supercharger it accomplishes that feat at a lower cost, both initially in the dealer showroom and later at the fuel pump. There’s also the argument for non-supercharged models for improved watersports performance as they don’t experience the rapid surges common to a supercharged engine, making it easier to control the speed as well as enact subtle increases or decreases. Yamaha enhances that engine control with cruise control, enabled with just the push of a button once you find your desired speed. Minimal adjustments can be made via up/down buttons to fine-tune that speed. Once set, users simply squeeze the throttle fully and avoid finger fatigue. No-wake mode likewise sets a constant speed, about five miles per hour, but doesn’t require any throttle input, making those long low-speed stretches far more tolerable. 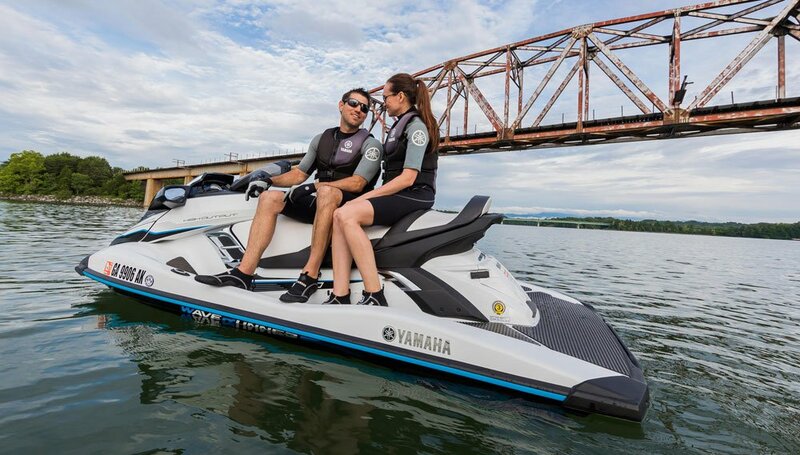 Further enhancing the craft’s performance is RiDE (a cool acronym for the more cumbersome Revolutionary Intuitive Driving Experience), Yamaha’s dual-throttle system unveiled in 2015. RiDE adds a secondary throttle, positioned on the left hand side of the handlebars. The RiDE lever essentially controls thrust in the opposite direction. At slow speeds, that thrust is used to go into reverse, making it much easier to control the craft in tight confines. Squeeze the RiDE lever further and the reverse thrust increases in kind. 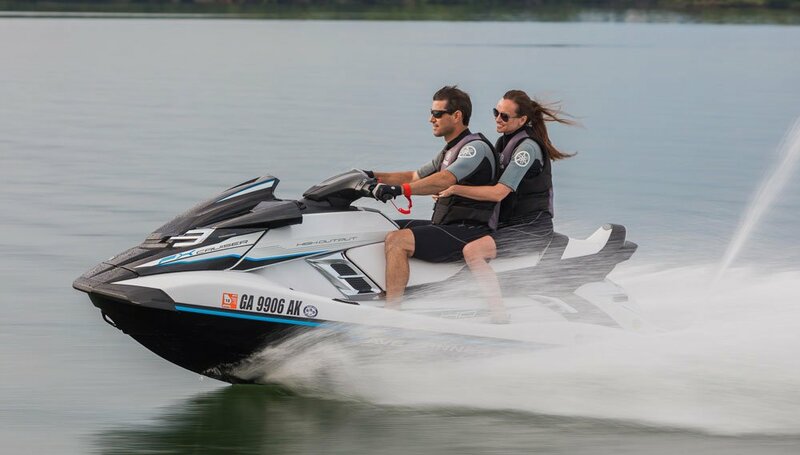 At high speeds, it provides rapid deceleration (Yamaha stops short of calling it a brake), deflecting the normal flow of thrust forward and to the sides to abruptly slow the craft. 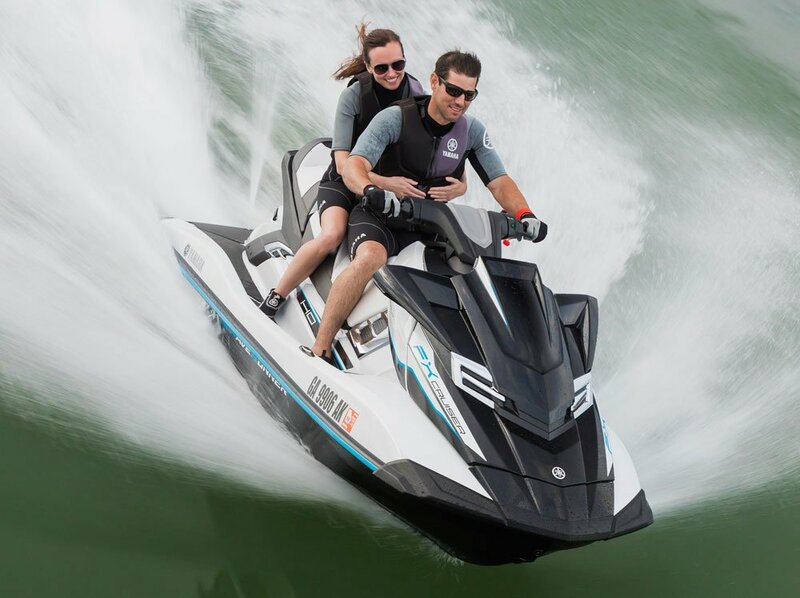 How does RiDE differ from Sea-Doo’s similar iBR? iBR functions closer to a traditional boat’s forward-neutral-reverse gears, with the feeling of shifting in and out of each. RiDE is more like a continual flow between movements. iBR brings a craft to a stop slightly quicker, but RiDE keeps the craft slightly more level during deceleration. In short, both work exceptionally well but each with their own subtleties. As to the lowercase “ride” of the FX hull, it’s tailor-made for cruising, especially in rougher, larger waters. Stability is excellent, and the hull tracks incredibly true, with no unexpected wandering. Performance-minded riders needn’t fear that translates to boring. That FX hull also carves like a nimble racer with an intuitive inside lean. Enhance those manners with electric trim, dropping the bow for the best cornering and raising it to enhance top-end speed. 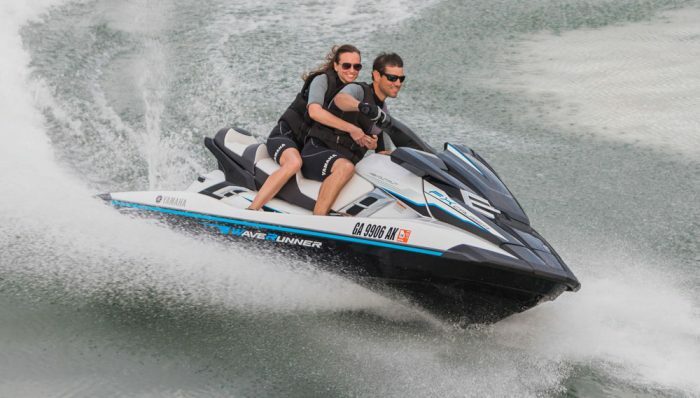 As to the amenities that round out the Yamaha FX Cruiser HO experience, look for the familiar Yamaha list of functional, but not excessive extras. In terms of rider comfort, EVA traction mats line the footwells and back deck, and a spring-loaded boarding step (with flat step area) is ready to help you aboard in deep water. Drivers enjoy tilt steering, pistol-style grips, and a tight cluster of buttons just forward of the seat to control modes on the dash info display. Storage consists of a large bow tub, a dash glovebox with dual cupholders, and watertight cylinder below the removable aft portion of the saddle. And speaking of that saddle, it’s not just bolstered, but notably tiered so that each passenger is positioned slightly higher than the one in front. The positioning makes for a more pleasant ride with better forward vision. Extras outside the norm include an actual cupholder on the dash to keep a drink readily at hand, and pull-up cleats to make for easy dockside tie-ups. Comparable models? The Yamaha FX Cruiser HO is priced in somewhat of a sweet spot between competitors from both Sea-Doo and Kawasaki. Sea-Doo’s less powerful GTX 155 runs $12,599; the GTX Limited 230 comes in at $14,999. Kawasaki’s Ultra LX is priced at $11,199, while the Ultra 310X jumps to $15,299.